I wandered up to Maine for a couple of days to visit a kind and brilliant clan that has made its home up there, and returned with a belly full of oysters and a head full of stories. The Reilly's have a six year old; formal education is no longer a theoretical concern. He's quite bright, his parents are sane, and he's surrounded by tidal water, so I'm not worried about him, but education came up a bit, enough to push some Maine into a post here. The Reilly's live a stone's throw from the rocky coast--the sea spills up over the rocks at high tide, and some gets trapped as the water ebbs. In the cold salty puddles lies another our world. 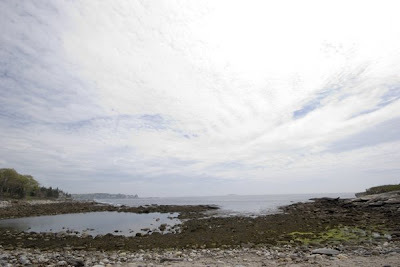 There's a "special" tide pool just down the road--The Rachel Carson Salt Pond. Rachel Carson, of course, wrote Silent Spring, exposing the pesticide industry's tendency to expose us. I'd still be there now if Mr. Reilly had not dragged me away for tea. Humans like boundaries. We like borders and lines and straight thoughts. We like to categorize and sort. We like our flour canisters larger than our sugar. Many of us earn a living based on boundaries. Surveyors and border guards are obvious boundary careerists, accountants less so. The masters? Public school teachers. Draw enough lines this way (not that way!) and you advance. How many parent/teacher conferences have been called to analyze the boy who refuses to color within the lines. (He can do it, he just won't!)? Rachel Carson was vilified by the chemical industry for reminding people that pesticides do not respect boundaries. DDT designed for mosquitoes does a wonderful job killing mosquitoes, but it refuses to go away once its job is done. The boundaries are in our heads, and now "persistent organic pollutants" are in our milk. Human milk. Breast tissue is mostly fat. Many organic pollutants are lipophilic, literally "fat loving." The chemical industry got the laugh last--Carson died of breast cancer, a disease that has more than doubled here in the States since 1940. That we even divide a body into parts shows how bounded we are. Doctors do not rip off a piece of you, they simply remove a breast, as though superfluous. Few true boundaries exist in nature. Getting beyond the tropopause is a trick for us, but molecules manage to bumble their way beyond it anyway without our help. The only wall there is in our imagination. Carson spent a good chunk of hours at a particular tide pool, but not because it was the Rachel Carson Salt Pond. That did not exist. Oh, the tide pool existed, but people do not come to visit the tide pool. They come to visit a shrine, the Rachel Carson Salt Pond. People drive past hundreds, thousands, of tide pools to get to this one, the one tamed by a sign and a sense of history. Visiting shrines and checking off lists makes us feel good--why else do it? While you're feeling accomplished, let the little one wander a bit. The Rachel Salt Pond makes for a great school field trip, but don't ruin it. Don't tell the kids all about Rachel Carson and DDT and chemicals, not yet. Don't tell them "If you're lucky you will see a this or a that...."
Don't teach them the names of the algae or the whelks or the urchins. Don't blabber on about the history of the Conservancy and the Pemaquid Lighthouse. Just tell enough to assure they won't drown or bleed the first 5 minutes they arrive. Maybe, just maybe, a child will get the same rush I got mindlessly watching an emerald sandworm undulating through the water. Mindlessly. We need more mindlessness in school. This part of Maine is a long way from big city natural history museums. Ms. Reilly worries a bit about getting her tadpole to a museum. She need not worry. Natural history museums are for folks who cannot get their kids to tide pools. The sign was taken from a UC Berkeley site. 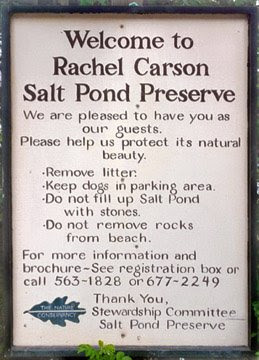 The picture of the Rachel Carson Salt Pond is by Steven Erat here, which he has generously granted a Creative Commons license. There's a park (Ninigret Park) on the Rhode Island Coast that hosts a folk music festival every fall. It's not folk like girls from Amherst with guitars, more like Zydeco and Appalachia and Gospel and Bluegrass. Anyway, people pay admission and camp out in the park for the weekend, I had the great opportunity to work for a vendor and visit the seamy carnival life for a minute. But I'm not good at staying up all hours, so while the other kids I was working with were making mischief, I went to bed at about 10, and woke up just before dawn. Thanks for another great post. I wanted you to know you've recently inspired me to plant a garden. I did my first round of indoor planting yesterday and built the garden with the help of a couple of friends. I'm looking forward to eating my firs homegrown salad in a couple of months. Wild, hidden places help define us--it's where we came from, and where we will return. Point well taken--mindfulness and mindlessness may not be opposites, at least not in this context. So many minds, so little time. The ultimate compliment--thank you! Gardening is a nice combination of working knowledge and faith. May you enjoy the fruit of your labor, and even the labor itself. I just came in after a barefoot tromp through my patch of heaven--the peas are about an inch or two tall now! Hello! Welcome home and back to the garden. This past week my students who take Biology went to Volo bog, and they were all dreading going - BORING - but when they told me where they were going I got all excited (Volo is - I think - the southern most sphagnum moss bog in North America) and geeked out about quaking bogs and nitrogen and ice ages and.... then I took a big deep breath and told them that a lot of what is happening at the bog they can't see and that they should just go and listen. They came home and told me that it was okay, but that they didn't need the whole day there. But they did listen and there was a lot going on. My peas are up! The lettuces are up! The spinach is up! It's good. I simply cannot read you. Nope. Not until my stupid degree is complete the middle of next month. I really cannot. Your posts make me think far too much for the time I have. I barely have the spare effort to throw a new one a week onto mine. My spare time begs for kisses from a two year old (not that I ignore the newest pup). Thanks for continuing to trot out ideas that are as old and as fresh as the sea itself.